During your Main Phase: You can Special Summon 1 monster”Fur Hire” from your hand, except “Beat, Bladesman Fur Hire”. 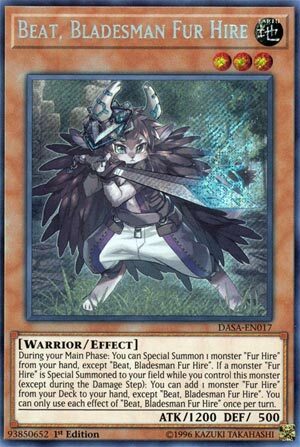 If a monster “Fur Hire” is Special Summoned to your field while you control this monster (except during the Damage Step): You can add 1 monster “Fur Hire” from your Deck to your hand, except “Beat, Bladesman Fur Hire”. You can only use each effect of “Beat, Bladesman Fur Hire” once per turn. Fur for Hire cards are poppin up on CoTD this week, and we start off with Beat, Bladesman Fur Hire. With not much Xyz possibilities in the archetype, being a Level isn’t a big problem. Special Summon ability from the hand, which in turn triggers a search for a Fur Hire monster from the deck. Not only does this monster support swarming ability and provide an instant Link 2, but it gets you a search to replace the monster you just Special Summoned. Beat shares the Special Summon ability most of the “Fur Hire” monsters have, which makes it easier to get your big beaters Dyna and Rafale on board. Recon and Donpa destroy cards on the filed, gaining you advantage. Beat, along with the other Level 4 and lower Fur Hire monsters are what start the swarm ability the deck possesses. With different Types and Attributes, the synergy is difficult to find with support cards, so the ability to swarm is key. I’d watch a cartoon of Fur Hire’s. Beat, Bladesman Fur Hire is a Level 3 Earth Warrior-type monster with 1200 Atk and 500 Def. The stats don’t really matter here since Beat is a very good combo starter and searcher. As a free Main Phase effect, you can Special Summon any Fur Hire monster except itself from your hand once per turn. It doesn’t matter how Beat is on the field to use that effect. If a Fur Hire is Special Summoned, you can search a Fur Hire from your deck to your hand, again except itself and again only once per turn. Beat could use higher attack since it needs to be face up to do either of these effects. However, it is searchable via ROTA and other low Level Fur Hire monsters. So we have a cute searchable searcher that can swarm. Sign me up. Beat is a Level 3 EARTH Warrior with 1200 ATK and 500 DEF. I don’t have high standards for stats on anything below a Level 4. Being a Level 3 Warrior makes it searchable off RotA and being EARTH isn’t too shabby. During your Main Phase, you can Special Summon a monster Fur Hire from your hand except another Beat. All of the low level monsters Fur Hire have this effect, so I shall call it the Fur Hire effect for now, and it is a nice effect for getting a board full of monsters Fur Hire. When a monster Fur Hire is Special Summoned while you control this card, you can add 1 monster Fur Hire from your deck to your hand. Nice searching, and if you summoned another low level monster Fur Hire, you can use it to summon the monster Fur Hire you searched, likely one of the bigger ones. Both effects are a hard Once Per Turn so the deck Fur Hire doesn’t get out of control. Beat is a must for any deck Fur Hire as a three of. It does all that the archetype needs. Art: 4/5 Cute little hedgehog looking thing. Welcome to Fur Hire week! (Where the puns are deliciously terrible, and the points don’t matter). Nobody appreciates a pun (good or bad) like I do. So, these guys, much like themes like Gadget (for one) of the past, like to bring themselves out as quickly as possible. They like to search for each other, and they do these things quickly. It’s standard and necessary that both the search and Special Summon are once per turn, and said Monster has to come from your Hand of the theme, excluding a clone of itself, naturally. You get the search as well while you control this Monster on the Field, so that’s an easy and obvious benefit. All these low level Fur Hire multiply like rabbits (another delicious comparison) to bring out the big beasts, literally. This is a big boon, and a wonderful and necessary combo piece to the Fur Hire family. Art: Also 4.5/5 This family overall is a well drawn and vibrant bunch of cards.